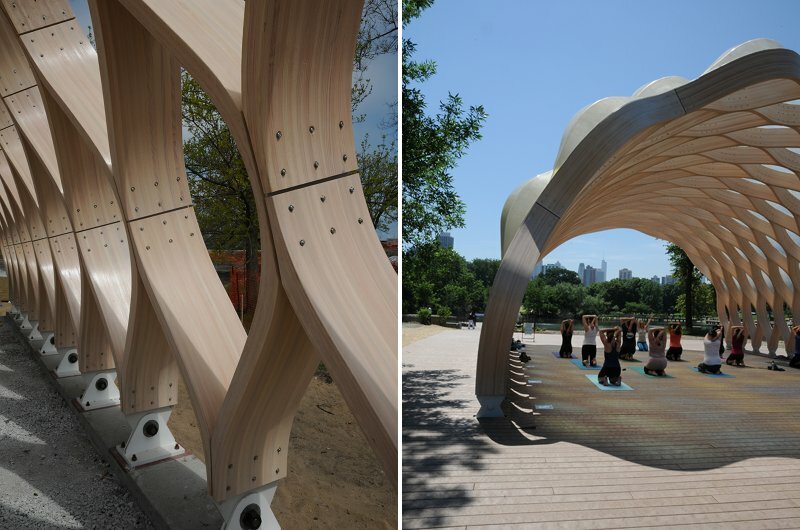 Part yoga pavilion, part outdoor classroom, the South Pond Pavilion at Chicago's <a href="http://www.lpzoo.org/" target="_blank">Lincoln Park Zoo</a> is a stunning architectural statement located along the Zoo's new Nature Boardwalk. 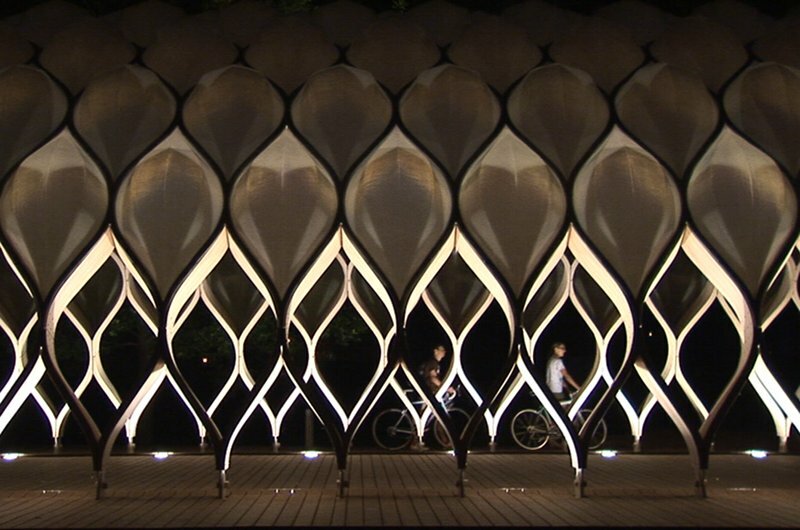 Designed by Chicago-based <a href="http://www.studiogang.net/projects_a5.htm" target="_blank">Studio Gang Architects</a>, the <a href="https://inhabitat.com/2010/05/04/latticed-french-pavilion-shades-a-green-walled-interior/" target="_blank">prefab pavilion</a> is part of a larger effort to rehabilitate the zoo's dilapidated pond into a natural habitat and exhibit of pond life. The project also features a boardwalk made from recycled plastic milk bottles, and other educational components. The yoga and education pavilion was completed this summer. 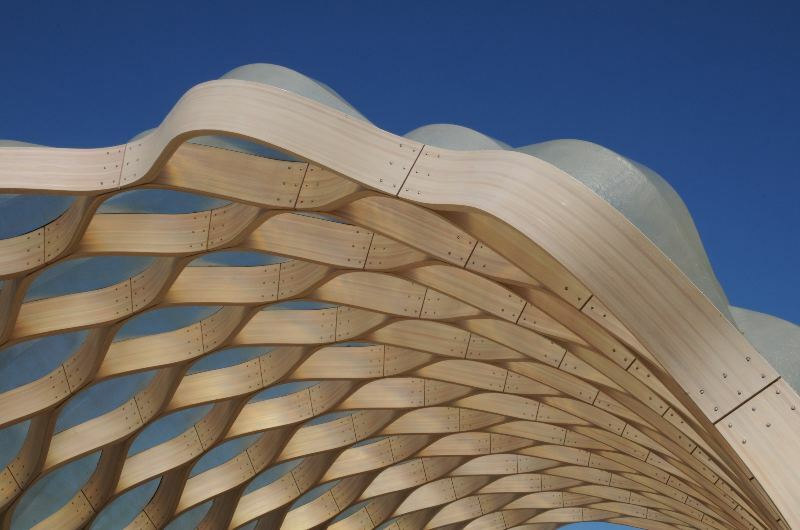 It's constructed of prefabricated laminated beams that were curved and connected to form the structural elements of the pavilion. Studio Gang Architects, a Chicago-based firm, was responsible for the design and engineering of the pavilion as well as the pond rehabilitation. 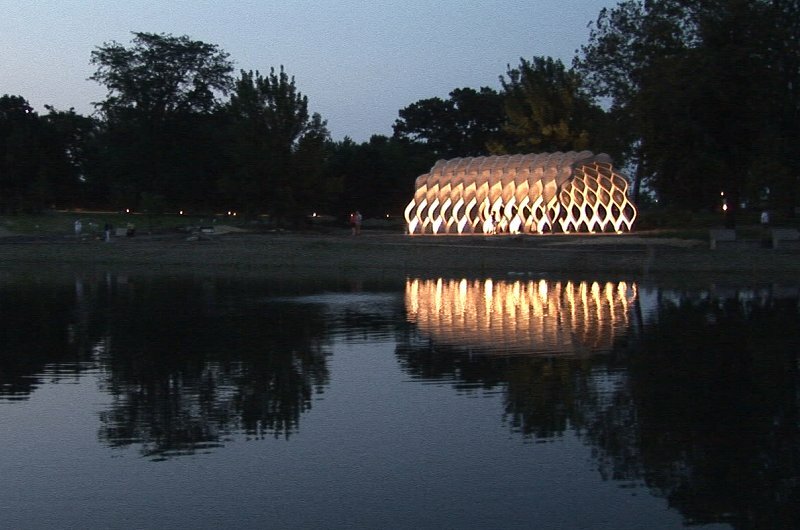 The pavilion was part of a larger effort to redevelop and rehabilitate a dilapidated pond in the Lincoln Park Zoo. 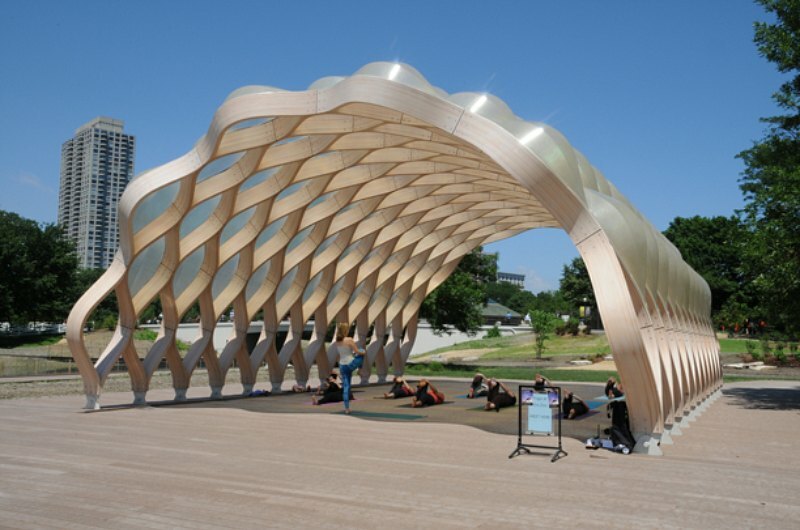 The pavilion is now used for yoga classes, educational programs and outdoor classes. 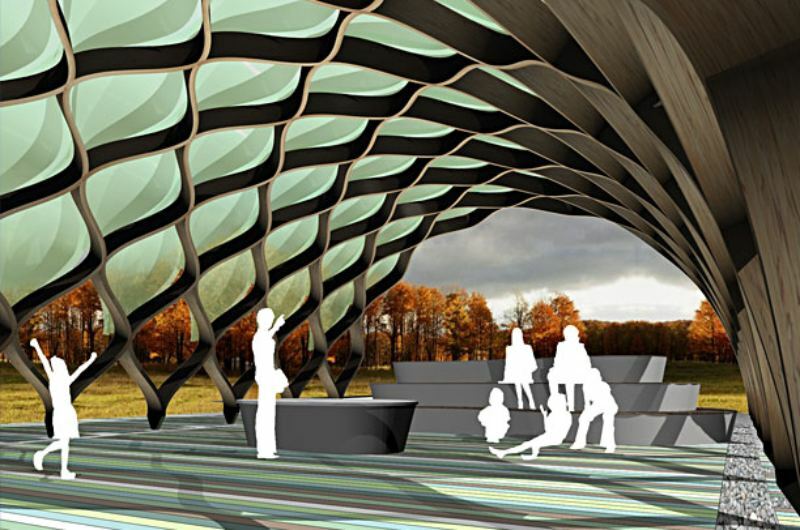 The top of the pavilion features semi-transparent fiberglass pods that protect the people underneath from rain but still provide natural daylight. 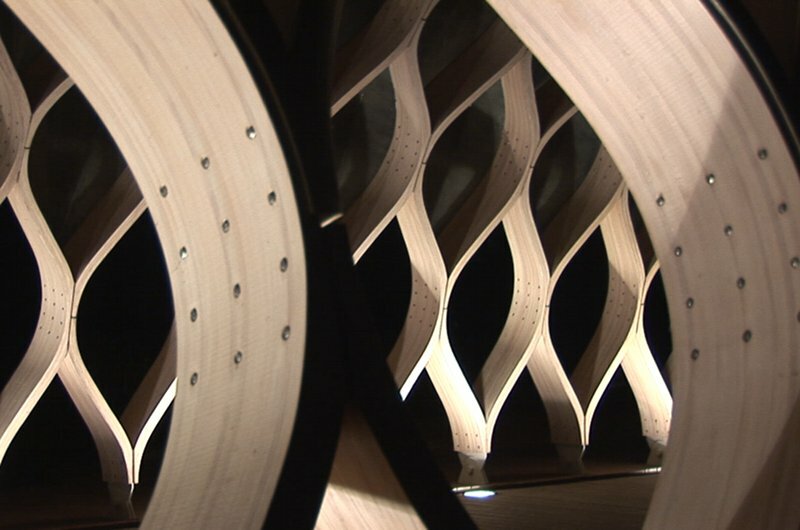 The pavilion is made from pre-fabricated wooden planks interconnected and milled to give global curvature to the surface, creating a column-free space for gathering. 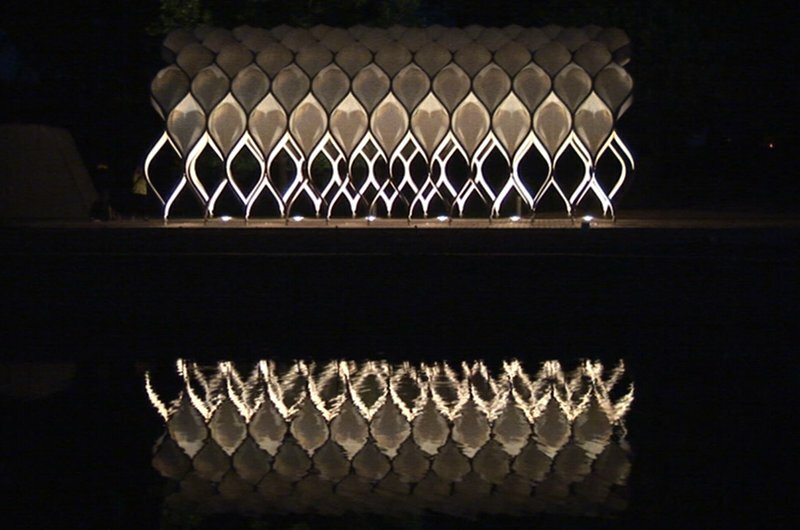 Inspiration for the pavilion came from the tortoises that inhabit the nearby pond. 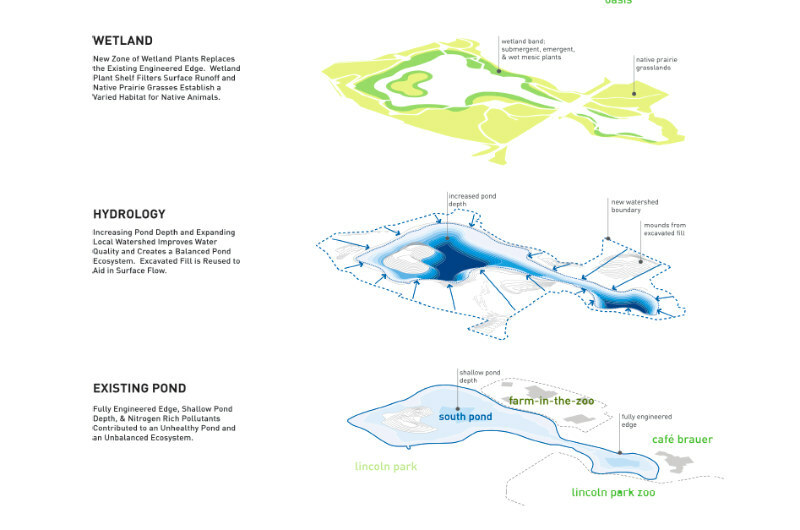 The entire project for the Zoo consists of pond rehabilitation, landscaping, and the creation of accessible pathways, educational pavilions, and exhibit design. 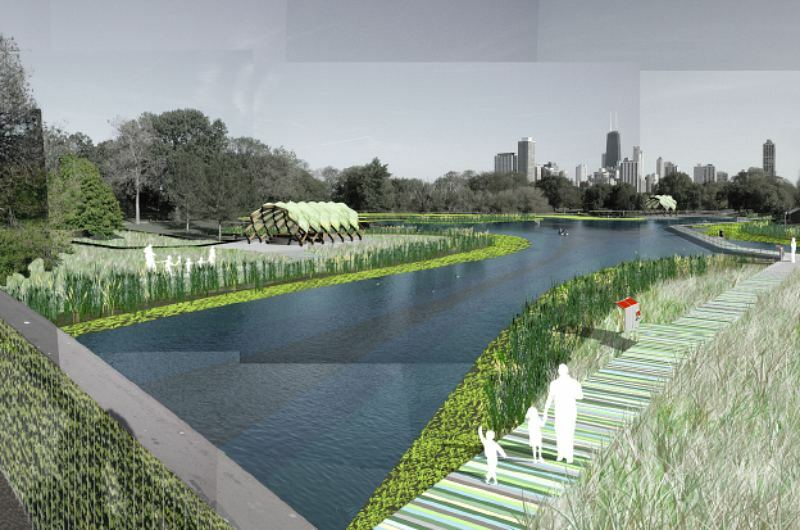 Surrounding the pond and pavilion is a network of boardwalks made from recycled plastic milk jugs. 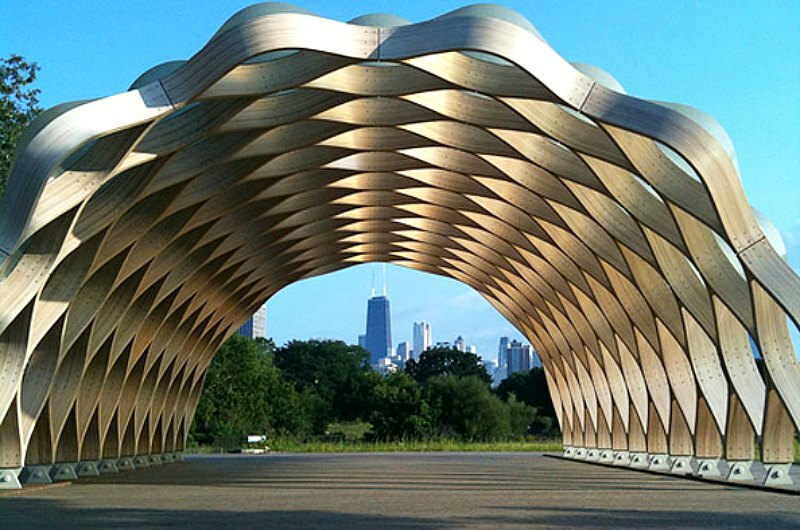 The pavilion serves as a focal point of the redevelopment project for the Zoo, which centers around a Nature Boardwalk, allowing visitors to get a up close look at the native inhabitants of the Chicago area. The South Pond Pavilion sits on the side of the revamped pond, which was deepened to improve oxygenation for the aquatic life. Wind turbines are also included in this project along one of the main boardwalks, as are educational kiosks that explain the rehabilitation of the wetland zone around the pond. 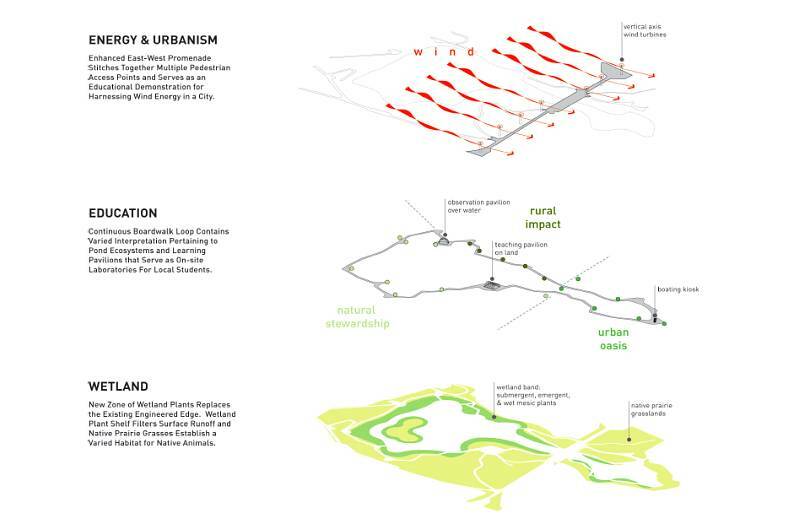 The wetlands and the revamped pond work in symbiotic relationship to create a healthy ecosystem. 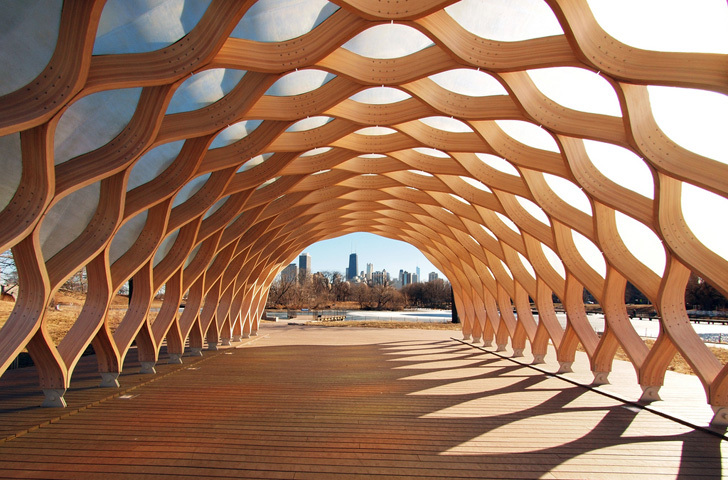 Part yoga pavilion, part outdoor classroom, the South Pond Pavilion at Chicago's Lincoln Park Zoo is a stunning architectural statement located along the Zoo's new Nature Boardwalk. 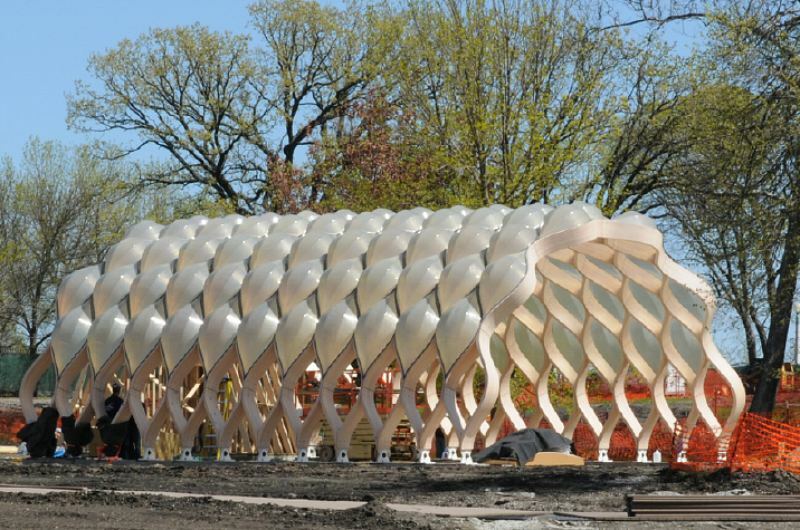 Designed by Chicago-based Studio Gang Architects, the prefab pavilion is part of a larger effort to rehabilitate the zoo's dilapidated pond into a natural habitat and exhibit of pond life. 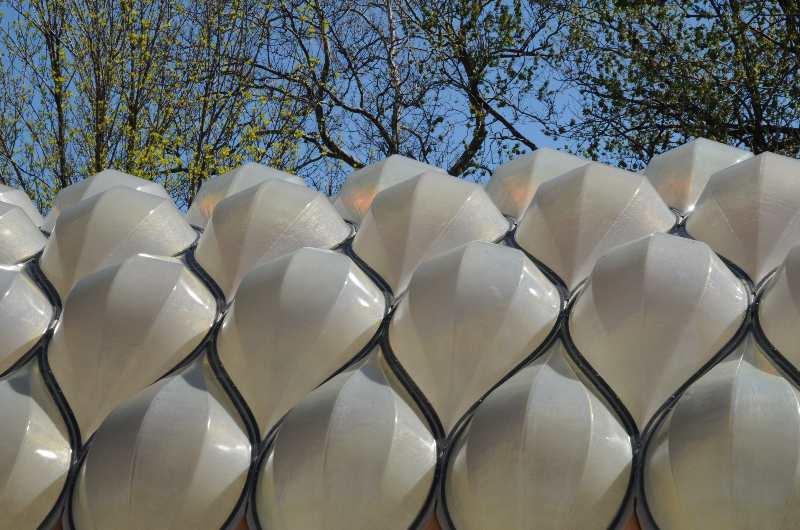 The project also features a boardwalk made from recycled plastic milk bottles, and other educational components.